The National Oceanic and Atmospheric Administration (NOAA) has yet again been caught exaggerating ‘global warming’ by fiddling with the raw temperature data. This time, that data concerns the recent record-breaking cold across the northeastern U.S. which NOAA is trying to erase from history. If you believe NOAA’s charts, there was nothing particularly unusual about this winter’s cold weather which caused sharks to freeze in the ocean and iguanas to drop out of trees. Here is NOAA’s January 2018 chart for Northeast U.S. – an area which includes New England along with NY, PA, NJ, DE and MD. You’d never guess from it that those regions had just experienced record-breaking cold, would you? That’s because, as Paul Homewood has discovered, NOAA has been cooking the books. Yet again – presumably for reasons more to do with ideology than meteorology – NOAA has adjusted past temperatures to look colder than they were and recent temperatures to look warmer than they were. We’re not talking fractions of a degree, here. The adjustments amount to a whopping 3.1 degrees F. This takes us well beyond the regions of error margins or innocent mistakes and deep into the realm of fiction and political propaganda. Homewood first smelt a rat when he examined the New York data sets. 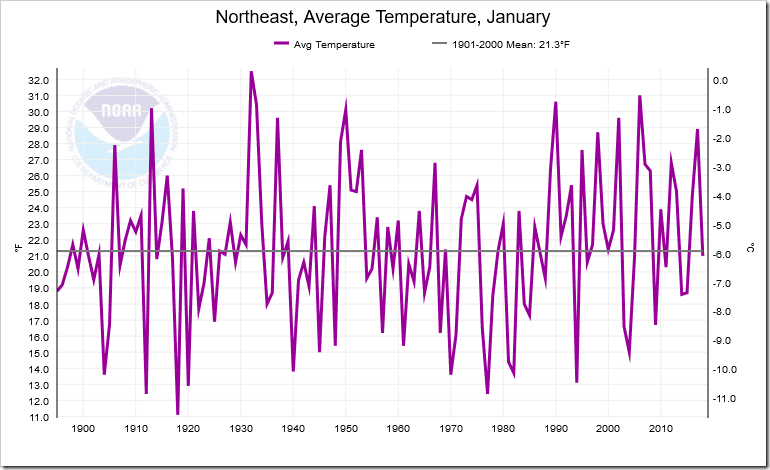 Earlier today NOAA allowed their Global data for January to escape into the public domain. It tells us that January of 2018 was 0.17°C lower than it was in 2017 and 0.33°C lower than 2016. Looks like the Paris Accord “scheme” is already working? Amazing what lowering those CO2 emissions can do. These data are always subject to adjustment however. So stay tuned. Why has there been total silence from NOAA? If the taxpayer pays their wages, the US people damn well should be addressed they require an explanation. btw Paul – nice one, the shame is, it should have been on USA national news. Maybe they prefer their own fake news? 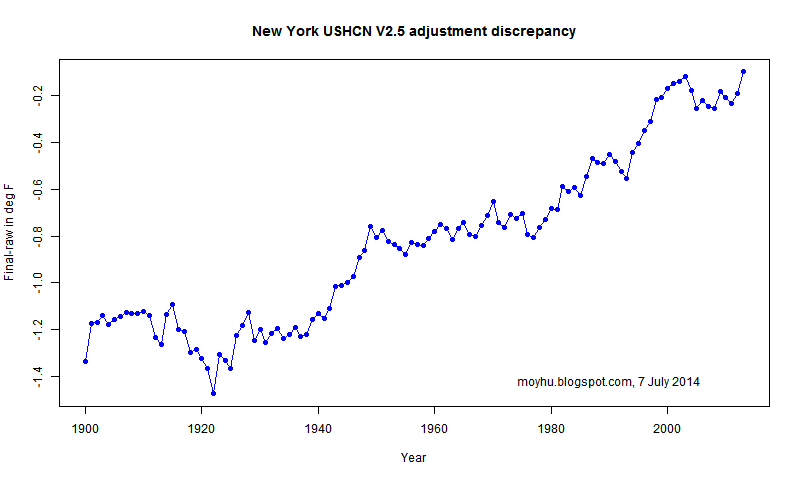 It seems to me that the NOAA could do itself a considerable service by publishing a temperature series based only on unadjusted data alongside their current series based on adjusted data. This would remove much of the suspicion of dishonesty which tends to surround their work. The additional effort would be minimal. The same averaging programs could be used for both series and the data entry has already been done in order to produce the adjustments. What is stopping them? Outlandish, unjustifiable adjustments. They wouldn’t dare. To be fair, there are solid reasons to adjust “raw” measurements, significant station movements, urban heat influence, time-of-observation bias, obvious outliers. But, having almost all of the older data lowered by adjustments? That’s a real problem. NOAA’s data adjustments from the old US Weather Bureau monthly files have been compared side-by-side. Annually, NOAA has lowered them an average of ~0.8°F. And, the British at East Anglia CRU have destroyed much of their original data. It’s not just a real problem, it’s nonsense. You can adjust for known issues but you have to be clear that the adjustment is a best guess, not an actual data point then. But to do even that, you need a large amount of solid, reliable data – otherwise to what are you adjusting the other data? Adjusting most of the data just cannot be right since you are saying that you don’t have much solid, reliable data – so on what basis are the adjustments made if you don’t know what the data was? It would not be so bad if they even published the Error Bars that their Adjustments have increased, but the rror bars are probably bigger than the total warming. The same as stops them responding to FOI requests and publishing their data with their papers so everyone can see. The simple truth is that the data they are using is guess-work, and should be treated with a great deal of caution. That’s fine, science can be like that, but if you want the whole world to change its economy, better not tell them that. That is the sort of easy step Trump could demand of NOAA. It wouldn’t cost a dime and would be brutally effective at delivering much-needed transparency. As a bonus the Green Blob would absolutely hate it. Paul, here are the daily *maximum* temperatures in degrees C for NY Laguardia Airport for January 2018, from GHCN daily. The first week of January was a VERY cold week, but the other weeks were quite warm, the monthly mean temperature quoted by NOAA looks about right. Note the many days of double figure positive temperatures later in the month. The Delingpole article starts off by talking about 2018. It is not that the NOAA temperature for last month is wrong, it is that they have cooled the past by 3F. Now compare that to this graph posted at WUWT that by the famous Nick Stokes, I am sure he won’t mind me reproducing it. It exactly proves Paul’s point, what is more Mr Stokes still condones the adjustments. Note it only goes up to 2014 and we know that the adjusments have got worse since then. I wonder how many of the Public understand that the declared adjustments in the Menne paper are responsible fro the majority of the Temperature changes since the Industrialisation started. It shows about 0.3C for Tobs and then another 0.5C from Tobs to total adjustements, ie about 0.8C overall. None! That is the monotonous secret, of the eternal success of Government excess. NICK STOKES BACKS UP PAUL HOMEWOOD !!!!!!!!!!!!!!!!!! Paul, all you need now is for Mr Booker to pick up the story. Guess those in New England this winter with the severe cold and storms, but no coal or natural gas thanks to their green politicians had no reason to whine. There was no cold weather.